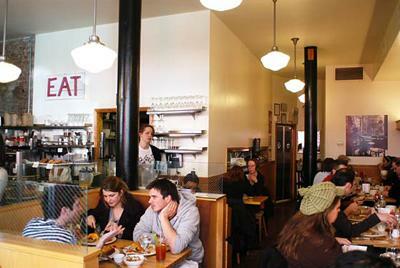 As promised, here are twenty restaurants I recommend to visitors of my fair city. This was a difficult exercise to say the least, as there are so many that deserve mention, but these are the first twenty that I would shout out if you were holding a glue gun to my head. 1. 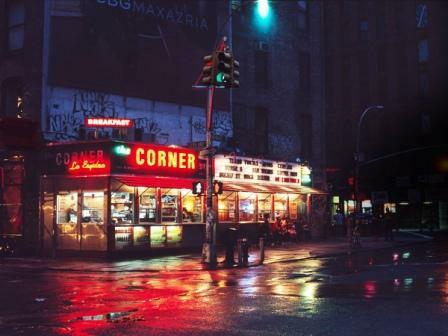 Schiller's - If you've read Lush Life by Richard Price, then you've already seen Schiller's, which graces the cover of the book (decent read if you haven't). The garlic shrimp will make your brain explode. Save some bread for sopping up the butter garlic sauce left in the skillet once all the shrimp is fought to the death over gone. Another requirement? Scoping the bathrooms. I've heard stories of actresses ending up naked in the sink. Enough said. Keith McNally's other restaurants are also winners, Balthazar, Minetta Tavern, Pulino's, Pastis and Morandi's among them. 2. DBGB - This popular spot is a must when you're craving a fancy beer or two after a long day of sightseeing. Ask the beer sommelier (yep, you read that right) for pairing suggestions to go with your bone marrow (yep, you read that right) or pulled pork-topped burger (yep, you read that right). I went through a three week bone marrow craze when I was pregnant (yep). Paired with my insatiable desire to smell beer during my entire pregnancy (yep), I dragged the hubs to DBGB at least six times in a month. 3. 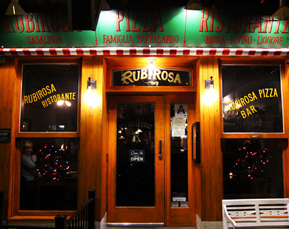 Rubirosa - Simply put, Rubirosa is what Little Italy should be but isn't. 4. Freeman's - If this sounds familiar, it's because it was the subject of this decor inspiration post back in May. You simply must order the devils on horseback. 5. Nobu - It's not a trip to New York without dining in a "big box" Japanese restaurant like Nobu, which has locations both in Tribeca and on 57th Street (as well as Nobu Next Door downtown) and counts Robert DeNiro as part owner. Order the rock shrimp tempura - there are copies of this dish in restaurants all the way to Bonefish Grill (bang bang shrimp sound familiar?). I also highly recommend ordering any sashimi that comes topped with jalapeno. ﻿﻿﻿﻿6. Clinton Street Baking Co. - this super darling and always dependable restaurant and bakery puts out delicious egg sandwiches in the morning and real fried chicken at night. But if you're anything like me, you order the pancakes for breakfast or for dinner. These things almost can't be called pancakes because they are superior to any pancake you've ever eaten during your entire time on Earth. 7. Falai or WD-50 - If you're looking for a "weird" but tasty meal that is akin to the kinds of culinary science and molecular gastronomy only seen on tv, then these two must be on your list. They do some freaky stuff (they once poured tea in my soup on purpose at Falai), all of which is insanely delicious. 8. Strip House - This is hands down the sexiest steak dinner you'll ever have. Look closely and you'll notice that the brocade wallpaper is actually a silhouette of naked ladies. Order the porterhouse for two and the black truffle creamed spinach, and just try to leave room for the 24 layer chocolate cake. 9. Momofuku Noodle Bar, Ssam Bar or Milk Bar - David Chang has hit the culinary jackpot amongst New Yorkers with his inventive menus and exclusive group chicken dinner & pork shoulder resevations. It's not always easy to get in, especially with bigger groups, so go early or opt to stop in a Milk Bar location instead for cereal milk soft serve. 10. The Standard Grill - Everything about this place, from its location at the Standard Hotel to the fact that it abuts the High Line, makes the Standard Grill anything but. Order the million dollar chicken for two. Coming in at $34, you're saving $999,966. How's that for a bargain? 11. The Spotted Pig - A Village institution, this place has a Michelin star and a female executive chef/co-owner, both being pretty legitimate stamps of approval. It's also a great place for star sightings, especially late night. ﻿﻿ 12 & 13. Dos Caminos or Rosa Mexicano - This is the subject of a long-standing but informal debate amongst New Yorkers. Everyone seems to have a strong preference in one direction or the other, but they are both Mexican institutions that make your guacamole tableside and have margarita menus that could keep you happy for days. Those who are too cool for Dos Caminos or Rosa Mexicano (both of which have multiple locations) will tell you to hit up La Esquina, a "secret" Latin restaurant downtown. 14. Breslin Bar in the Ace Hotel - good anytime, but stop by for breakfast. Get the fried peanut butter and banana sandwich if you plan to walk all day. If not, scale down your indulgence with the pastries basket. 15. Shake Shack - people wait in line (or "on line" as New Yorkers say) in Madison Square Park for hours for a burger and a shake from Shake Shack. Skip the epic lines and visit one of the other two locations further uptown, one near Times Square and one near the American Museum of Natural History. All of Danny Meyer's restaurants are respectable, so if you've already had a burger at DBGB, try out some of his other offerings. He also has outposts at the new CitiField, so if baseball is on your list, save these stops for your Mets game. 16. The Plaza Food Hall by Todd English - Eloise can eat her heart out. Located in the lower level of the Plaza Hotel is Todd English's culinary wonderland, offering everything from sushi to dumplings to pizza to cupcakes. This is the most awesome compromise for groups who can never decide on what to eat because there's a little bit of everything. Oh, and you're in the Plaza. 17. 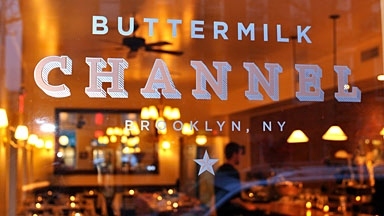 Buttermilk Channel - This is the neighborhood restaurant every neighborhood could only dream of having. Be sure to order the pickles, hush puppies and almonds as well as the flatbread to start. People (and by "people" I'm referring to Tyra Banks) travel in from Manhattan for their fried chicken and duck meatloaf. 18. Diner - You can't go wrong with any of the restaurants in this Brooklyn mini-empire (Roman's, Marlow & Sons or Marlow & Daughters), but Diner is worth the trip simply by virtue of its unique setting (any guesses?). All of the Marlow, Inc. digs offer constantly rotating menus that feature the best of local, organic and seasonal produce. 19. 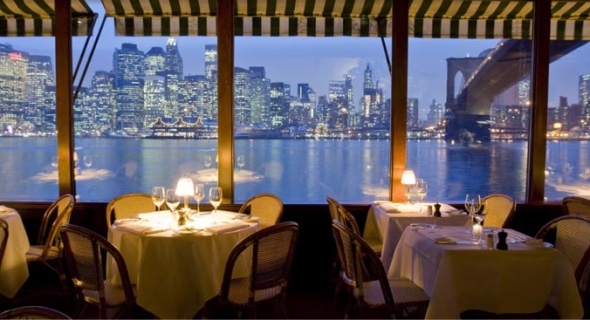 The River Cafe - If you've ever wanted to visit Woody Allen's New York, the bar at River Cafe is a pretty close approximation. While dinner at this institution is a big undertaking both in hours and price, a cocktail at the bar (a Manhattan, peut-etre?) will leave you feeling like Annie Hall. Afterwards take a stroll through the Brooklyn Bridge park and then catch the ferry back to the city. 20. Roberta's - Roberta's is one of those places where you're not quite sure you're in the right place, but believe me, once you find it you'll never want to leave. Everything on the ecclectic menu is good. And who knows, you may just find yourself nine months pregnant being interviewed by a travelling French food reporter for national French television while you're there. As they say, only in New York. Okay, so that's technically forty two restaurants, which is fairly indicative of just how many great options there are to enjoy. What's your favorite, is it on this list?